Location, location, location! Seller financing available-terms negotiable. Gorgeous 2 story, 5 bedroom gulf access home situated on a basin with the most incredible views of the river. 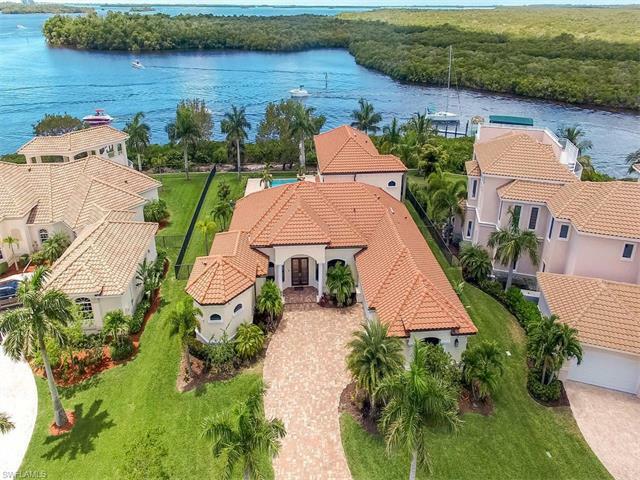 This property is located in one of the finest neighborhoods in sw cape coral and offers deep water sailboat access, elegant design and tropical landscaping. As you enter into this magnificent 2 story entry you will be captivated by the volume ceilings and spacious floor plan. This magnificent home offers 5 bedrooms, 3 bathrooms, and a 2nd-floor loft/sitting area. Also, 2 master suites. First and second-floor master suites w/full bath. The second-floor master suite features sliders opening to a balcony with gorgeous views. Chef's delight kitchen w/granite, stainless steel appliances & accent lighting over the cabinets. All this overlooks the sparkling pool, spa, & basin. The balcony runs the full length of the 2nd level looking down on the outdoor living environment, & views of the caloosahatchee river! The lanai features an oversized pool, spa & outdoor kitchen/grill/bar overlooking with water views. This home is complete with a 10,000 lb boat lift, canopy & dock. Very successfully vacation rental. Location, location, location! This beautifully remodeled home is located in one of the most sought after neighborhoods in cape coral, and it offers unrestricted sailboat access water frontage, quick access to the gulf of mexico, southern rear exposure, and it literally a 1 minute walk to cape harbour marinas waterfront restaurants, shops, & entertainment. Spacious layout featuring an open great room with soaring ceilings, 4 bedrooms + a den, 4 full baths, a dream kitchen, 2 dining areas, a 2nd floor loft/family room, and a 3-car garage! Features include custom wood cabinetry, exquisite granite counter tops, travertine & hardwood flooring, decorative shower & bath tile, wood trimmed ceilings, gorgeous light fixtures & ceiling fans, crown molding & tray ceilings, and so much more! Beautiful outdoor area with a sparkling pool, brick paver decking, raised mansard screen enclosure, and outdoor shower. Wrap-around composite boat dock w/ 10,000 lb. Lift, a covered boat canopy, and an additional floating dock to accommodate jet skis, kayaks, or a small skiff. This home would be a wonderful full-time residence, winter retreat, or an incredible vacation rental! Dont let this one slip away! Reduced! If you're looking for a large gulf-access home in sw cape with no bridges to the gulf, this is your ticket! In fact, there isn't a lower price in sw cape for any home over 3,500 sf and no bridges to the gulf! The only listings you'll find that are cheaper are significantly smaller and/or older! Pool, spa, wrap-around composite dock, lift, outdoor kitchen w/built in grill and bar, 3 car garage - this one has it all! Whether for a large family, many guests or an unbeatable vacation rental, this home has all the space you'll need. It offers 5 bedrooms + loft + a huge bonus room that could also serve as a large 6th bedroom! There's also the great room as well as formal dining and formal living spaces. There are also 3 baths, including a pool bath and both master and upstairs guest baths offer dual sinks. You'll enjoy a spacious kitchen with ample cabinet space and large island with eat-in space as well as a large breakfast bar. Two sets of tall sliders lead from the living spaces out to your paver pool deck. The 2nd floor master suite even offers its own private screened lanai overlooking the pool & canal. Original owners have meticulously maintained this terrific property! Breathtaking and newly remodeled direct sailboat gulf access pool home located in unit 64. This 2010 built home features over 3,000 sf living area with 4 bedroom 3. 5 bathrooms and 3 car garage. Remodeled throughout with modern touches throughout, new pool 2013, interior paint, plantation shutters, even new bedroom and full bathroom. Open kitchen with granite counters, island, and 2 pantries. Spacious living room overlooks the pool and water through 4 sliding glass doors. 2 generously appointed master suites with terrific views and updated contemporary baths. Equally impressive guest bedrooms, and upstairs loft or second living room. Incredible newer heated pool with sun-pad and plenty of outdoor room to entertain, bbq, and relax. Direct access via the wrap-around dock & lift. Sold furnished & turnkey. The ideal home for a large family, vacation home, or furnished rental. Unit 64 is known for its water access and coveted location in sw cape coral, call to view the home and see why!